Opaque deep garnet, medium-to-full body. Mocha dust followed by the slightly herbaceous integrated fruit & earth nose, with toast & plank hints. Emerging extracted toasted black fruit flavors with mocha/coffee hints. Dark chocolate mint items (mint milanos, thin mint girl scout cookies, Andes mints, dark chocolate mint M&Ms, Junior Mints, etc. ), beef dishes (steak, steak tips, roast beef, kabobs), stuffed peppers, chili, horseradish cheddar, roast beef roll ups, peppered meats, dark chocolate raspberry squares, brownies, various chocolate dessert items. 18-20 days cold soaking, then alcoholic fermentation at 77-82 degrees Fahrenheit with pump-overs and cap punch downs. 85% of the wine was aged on its lees for six months in tank in contact with older French oak inner staves & mico-oxygenation. 15% was aged in older French & American oak barrels. 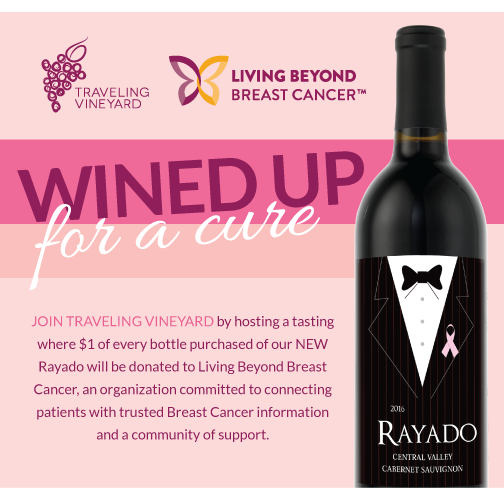 To help with the fight against breast cancer Traveling Vineyard is donating one dollar from the sale of each full-price bottle of Rayado to Living Beyond Breast Cancer (LBBC). LBBC is a non-profit that connects people to trusted breast cancer information and a community of support. We loved the Rayado, the Cab Sauv had a very bold yet smooth flavor. Loved it, bought another on next order! I bought two bottles as an early Christmas present for myself - that way I know I'm getting exactly what I want! This wine is a very good Red with great flavors, it is almost a perfect wine, just lacking slightly in smoothness and a full finish. Julie was a wonderful and gracious representative! The wine was delicious, the service was warm and kind, and the delivery was extremely quick!! Thank you! I loved how smooth this wine was on the pallet. At first taste it is a bit dry but overall a nice red that is smooth and well balanced. 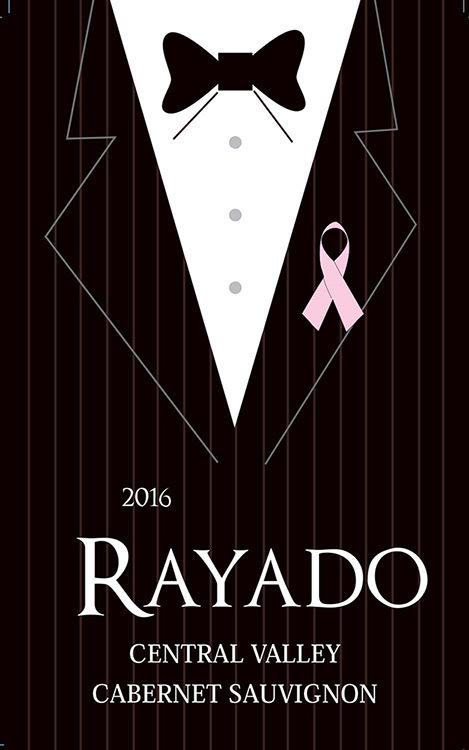 Rayado is one of my favorite wines. Full body! Excellent wine, especially for the price. Loretta helped me pick the perfect variety. Will definitely order again!